The newest Moto Mod to join the ever-expanding family is the Moto Smart Speaker with Amazon Alexa. With this speaker connected to your Moto Z device, you’ll be able to access Alexa by voice command at any time. Like all other Moto Mods, this Amazon Alexa-equipped smart speaker works with the Moto Z and Moto Z2 family. All you do is slap it on the back and it’ll just work, giving you access to Alexa to play music, get news, grab answers to questions, control your smart home, order an Uber, add items to a grocery list, etc. 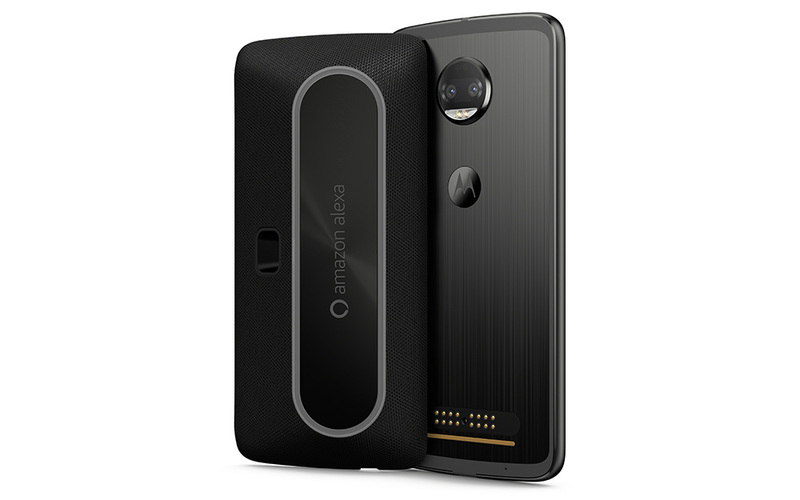 It’s like an Amazon Echo, only in Moto Mod form on the back of your phone. The speaker has four microphones inside, so it should be able to hear you from across the room as well. It’ll even act as a nightstand clock, thanks to its design that allows it to angle nicely when on its back. Motorola says to expect up to 15 hours of built-in use through the speaker’s own battery. This new Moto Smart Speaker with Amazon Alexa arrives in November for $149.99 at places like Amazon, Best Buy, Verizon, and Motorola’s online shop.